Do small businesses create more jobs than larger firms? A Washington Post article about Obama's small business proposal says that according to a Kauffman Foundation study, "small businesses create most of the nation's jobs". Not to be discouraging, but I couldn't find that statement in the cited report. Kauffman states "the top-performing 1 percent of firms generate roughly 40 percent of all new jobs". They are talking about 1 percent of all sized companies not just small businesses. As the founder of two startups, I was curious to see if I could answer the question: do small businesses create more jobs than medium to larger firms? My curiosity led me to the Bureau of Labor Statistics. They pointed me to some stats on their site. 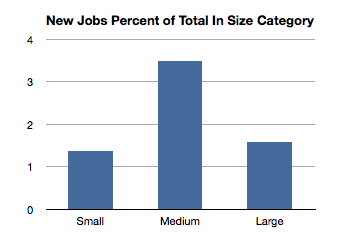 In absolute terms, the mid-sized (50-249) and larger firms (250+) each created more jobs than small businesses. In relative terms, the mid-sized firms had better growth than both small and larger firm categories. And larger firms did better than smaller firms. There's one caveat. As a small business grows, say from 49 to 51, the numbers will reflect a loss of two employee in the small business category and a gain of two employee in the mid-sized category. So, please consider that movement between categories has real effects, such as showing a loss in jobs when in fact, it's from growth to the next category. Another thing to consider is that these numbers don't reflect the gazelles or the new technology startups that are growth driven. They are much different than the barber shop or the local retail store. I would expect the numbers to favor the small category for job contributions, except maybe for the ultra fast growing companies like Facebook or Google that started with just a few employees and grew into the thousands in a short period. It should be clear that real job creation comes from startups that can move up from one category to the next, creating thousands of new jobs as they go. In summary, journalists should consider the facts before generalizing the "small business" category. Likewise, this opens up the door for new research that considers gazelle-like companies that are being built to innovate and create real job growth. I would like to invite someone out there who would review the industries that foster innovation and show their effects on new job growth.